We are proud to announce that Lynda Doucette is joining the wonderful group of Event Leaders this coming season. After recently retiring from a long career with the National Park Service, Esther Blakely was kind enough to make the connection for us, and we are pleased that Lynda will be sharing her immense knowledge and leading hikes (including night hikes!) at The Swag from July 29-August 5. Originally from the northeast, Lynda has enjoyed a long career with the National Park Service — working across the country — including Cape Cod National Seashore, the John F. Kennedy National Historic Site, Lake Mead National Recreation Area, Yosemite National Park, and Point Reyes National Seashore. 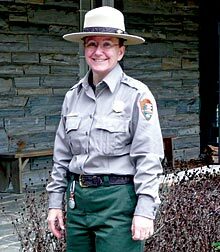 Lynda has spent the last decade-plus as the Supervisory Park Ranger at the Oconaluftee Visitor Centers in the Great Smoky Mountains National Park. As an interpretive ranger, Lynda focused on education and events that would help visitors appreciate all the Great Smoky Mountains National Park has to offer. We completely agree, and we hope you will join Lynda at The Swag! We are fortunate that she is willing to share her love of the Park and these mountains, the creatures, and its history with us. Call us at 828-926-0430 or book your room online here. The Mountain Farm Museum at the Oconaluftee Visitor Center.